Open All Year... A legend since 1936, the King George has been home to kings, princes, presidents and Athenian alike. A legend since 1936, The King George Palace has been home to kings, princes, presidents and Athenians alike. The only hotel in Athens among the 75 Top Europe Hotels of the Conde Nast Traveler U.S.A. Reader’s Choice Awards, also honored on the 2005 Hot List and the 2007 Gold List. Some people have status and some seek status from symbols. The King George Palace was created for people who recognize quality and demand excellence in all they do. A member of the Leading Hotels of the World, the King George Palace combines the grace and stature of a historic landmark with ultramodern amenities and personal service that puts guests’ comfort above all else – right down to a personal trainer in the state-of-the-art health club, exclusively for hotel guests. The King George Palace was originally built as a small urban palais that served as an annex to the Palace, which then occupied the building that houses Greece’s Parliament on the square’s eastern flank. Later, it served briefly as the prime minister’s residence before being acquired by a Greek businessman who added several floors and converted it into a hotel. One of its first guests was King George II, who made it his haunt. In the Fifties, Sixties, and Seventies, it was also the favourite hotel of international celebrities, magnates, world leaders, and movie stars like Aristotle Onassis and Maria Kallas, Grace Kelly and Prince Rainier of Monaco, Marilyn Monroe, Brigitte Bardot, Frank Sinatra, and Francois Mitterand. 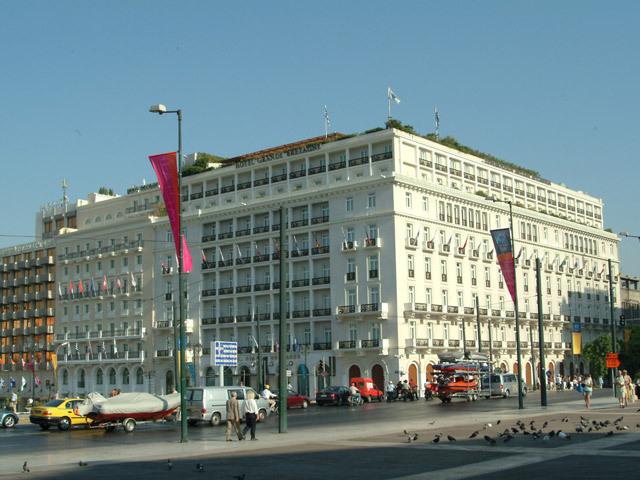 Ideally located on Constitution Square, this hotel is one of the most famous landmarks in Athens, in the heart of the business and shopping district. Within walking distance from the Acropolis, the Old City (Plaka) and most of Athens sights and attractions. Located on the ground floor, is the best place for rendezvous, after work. Here, intimate flirts with daring. Here, a place open to the city, to stay for hours, to drink, eat or listen to the music of the DJ’s. Here, a place where the city comes to you. Horse lamps designed by Front for Moooi, and black baccarat chandeliers lighten up the royal blue sofas and the crown artwork by Dimitris Antonitsis, on the left. Enjoy the exquisite Greco-French cuisine on the right side, sitting on the famous Moooi smoke armchairs in front of Konstantin Kakanias paintings. Sip your caramel cappuccino in a golden cup in the library area with the golden Gun Lamps by Philip Stark, just above Scott Campbell’s wall tattoo: “I was very good at doing what I was told”. Drink Athens’ most exotic cocktails at the Space Bar with the Mooi Dear Ingo hybrid lamp above. On the 7th floor, The “Tudor Hall”, Athens most acclaimed gourmet restaurant, overlooks the Acropolis and boasts a Greco-French menu by galloping Gallic Gourmet Alain Ducasse formation. This is a favourite rendezvous for politicians, diplomats, corporate executives, and international celebrities. Beneath the stunning glass dome, deals are brokered – and wedding proposals made – over an imaginative menu and a panoramic view of the city.